Most rooms were designed and built to house furniture, home electronics, cabinets and other squared-off decor and devices. All that "squareness" encourages low frequencies from your mix, songwriting, or rehearsal to build up in the four corners of your space. Ultimate Acoustics' UA-WPW-12 professional Absorption Panel is the perfect blend of form and function for acoustically treating small, medium or large spaces. The wedge style holds traditional design, while the foam base provides maximum absorption in the smallest possible space. And Ultimate Acoustics free Room Analysis App helps you plan and execute the ideal deployment for your space and application. 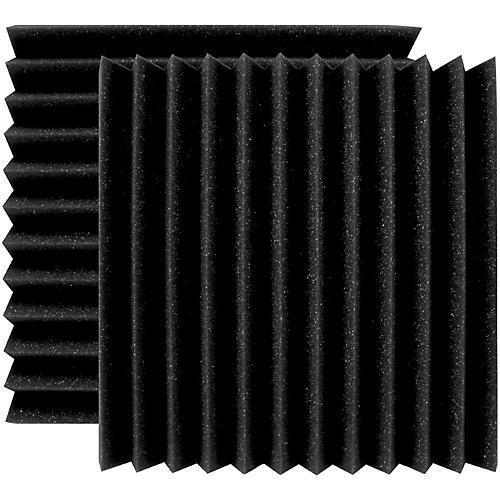 In acoustical foam, quantity matters more than shape. This is because the softness of the foam provides no reflections on its own “ it simply absorbs. So cutting the foam into egg-crate or similar shapes only reduces the amount of foam available to absorb sound. The UA-WPW-12s foam base gives the maximum amount of sound absorption in the smallest possible space. There is a tendency when treating a space to simply "deaden" the environment by completely covering surfaces in absorptive materials. But this is not the best approach to critical listening. Better to have the right balance of live and dead surfaces, so as to create a room with a controlled response to sound. This gives a much more realistic, pleasing and productive reference situation for mixing, tracking, or just plain listening. NOTE: Samples of Ultimate Acoustics studio foam products have been commercially tested, meeting the criteria for a Class B rating. Color fading may occur with UV exposure over time. Sunlight and direct light from standard bulbs should be avoided. Color fading not covered by warranty.